Water damage is something that can occur after a natural disaster as well as from faulty plumbing and more. It is a serious problem. 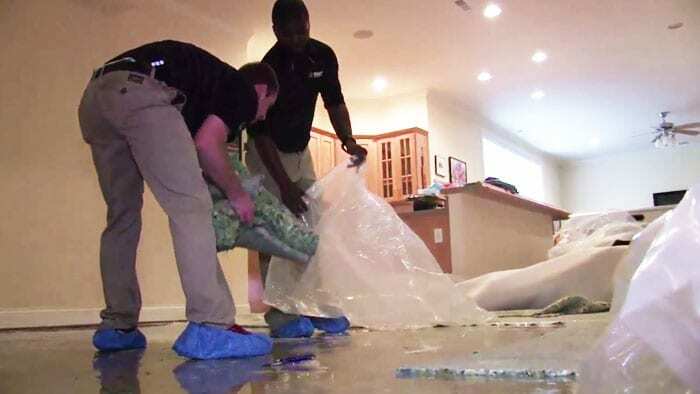 When water pools in a person’s house, it can soak through anything it touches. This water will quickly become a contaminated liquid. It will contain many different types of microbes as well as bacteria, deadly viruses and more. A flood can bring water containing hepatitis, cholera and other diseases into a home. The more time moisture is permitted to stay in a home; the more problems will occur. This is a primary concern for anyone whose home has been damaged by water. Should this situation not be fixed as soon as possible, mold could quickly spread. It will release many different spores into the air. When this happens, mold can form on parts of a home that may seem dry. Short-term exposure to mold may not be too serious. Should individuals regularly inhale mold spores, they may experience various health complications. The old and very young are most susceptible as well as individuals who have a compromised immune system. A certified technician will know how to restore a home that has experienced damage from water. The first thing that will be done is any, and all compromised material will be removed. This will include upholstery, carpeting as well as carpet padding, baseboards, and insulation. All fragile woods will be removed. This includes plywood, particle board, ceilings, sheetrock walls as well as any materials containing gypsum. Once this is done, any standing liquid will be pumped out. All areas affected by water will be dried and disinfected. It is a process of home improvement that may require several days to complete. Air mover fans, heat injection fans as well as dehumidifiers may all be used. There are certain things a homeowner can do to decrease the chances of damage from water in their house. It’s important their roof gutters be cleaned. When a gutter is clogged on a rainy day, it can send water pouring into a home’s foundation. Water can get into a home through the roof as well as form in the basement. This is something that can result in significant water damage. A house will have water pipes that are located out of sight. They will be in the floors, hidden walls and more. It’s easy to not know their location until there is damage from water. It’s important homeowners pay close attention to their monthly water bill. If it is unusually high, there is a good chance a leak exists somewhere in the house. It’s also important to avoid using caustic chemicals to remove a clog in the drain. This could cause pipe damage. If possible, a homeowner should always use a drain snake. When a homeowner has experienced damage from water to their house, it’s time to contact restoration professionals. They are licensed specialists who will be experienced in utilizing the most effective methods for restoring a home. These professionals will know how to provide the latest technology for the best possible result. They will know how to dry out a house and stop bacteria and harmful fungi from forming. When a home has experienced damage from water, it can be a dangerous situation. If not dealt with properly, it can cause a very unhealthy environment. This can be resolved by professionals who know how home improvement can result from the elimination of problems caused by water.